SC1146 Thinking about Life Cycle and Food Chains cards - 20 A5 cards featuring a photograph on one side and five questions or activity suggestions on the reverse. The variety of questions and activities means that work can be pitched at an appropriate level for most abilities. The cards have been designed to develop an enquiring approach to the subject and encourage observational and descriptive skills. 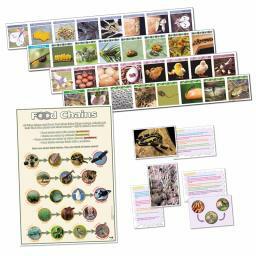 This versatile set lends itself to whole class, small group or individual work, forming the basis for the whole topic or as a starter or plenary activities. How does an egg help a baby bird to survive and grow before it hatches? Which animals are marsupials? Where do they live? What would happen if there was a shortage of a snake's prey? Research a polar bears diet and draw three food chains with polar bears at the top. Make a list of plants that grow from bulbs rather than seeds. Make a timeline showing the life cycle of a sunflower. Create a fact file with the title 'Carnivores, Herbivores and Omnivores'. Find at least three examples of each and research their diets. What do they eat, how much do they eat and where do they get their food? SC1120 Food Chains Poster - An A1 poster showing five different food chains which highlights the roles of producers, consumers and predators.